Generators for industrial purpose come with various configuration and features. It’s imperative that customers should know details about generators before they go for the hire or purchase, things like running costs, fuel efficiency, fuel tank capacity, Power factor, and so on. The most common generators used are Diesel and Petrol generators. The diesel generators are expensive than the petrol generators, but over the long run, it is beneficial as the maintenance cost is less and fuel efficiency is better. Some well-known generator manufacturers are Kirloskar, Cummins, Sudhir and Mahindrapowerol. 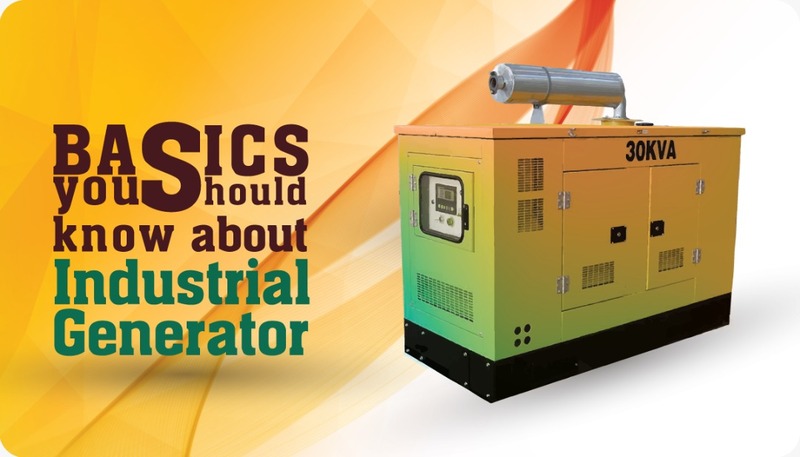 Let’s see some of the parameters that you should consider before hiring or purchasing an industrial generator. Most commonly used generators for small and medium size industries are 82.5 Kva, 125 Kva, 250Kva, 500Kva. Usually, there is a misconception that smaller size generator performs better but in actual it is other way round. Bigger the size better is the performance of the generator. Choosing smaller sized generators may harm appliances that pull power from generators. By totaling the power output exuded by your appliances you can calculate total electric consumption and determine generator size. You can consult a certified electrician to analyze your requirement or determine the starting and running wattage. You can also use equipment manual to check the starting and running wattage of industrial tools and equipment. When selecting industrial generator factors like prime power rating, load combination and maximum power should be considered. Storage capacity is determined on how long the generators may be required to run also known as Run-Time. The run time of engine depends on the fuel efficiency and fuel tank size. The fuel storage capacity for the above mentioned generators are 145(Litres), 290(Litres), 450(Litres), 690(Litres). Generators larger in size are more efficient when comparing their liters per kVA, same with the liters per hour. In comparison to petroleum and natural gas generator, a diesel engine has better fuel efficiency. But note that a diesel engine operates better under load, it should not operate less than 50% load. The rate of diesel varies across countries, in India diesel price is 55-60/litre. If you consider 85 kva capacity engine, then fuel consumption on per hour basis would be 21 ltrs/hr. So the cost you bear for running a generator of 85Kva per hour would be Rs 1100-1200. Likewise, you can calculate the cost per hour for other operating engines. For instance, the consumption by 125Kva-31Ltrs/hr, 250Kva-58Ltrs/hr and 500Kva-107Ltrs/hr. For better fuel efficiency you need to check diesel standard on parameters like cetane number, sulphur amount, fuel viscosity, gravity, distillation, flash point, pour point, water and sediment, carbon residue and so on. Power factor is a unit to calculate electrical systems efficiency. It can be defined as the ratio between the kVA and kW drawn by an electrical load. The lowest power factor of the load is 0.8, it is the bare minimum limit under which diesel generator should be operated. Generator operating below 0.8 pf will consume more fuel. Diesel engines expected to incur maintenance only after operating at 1800 RPM for 12,000 to 30,000 hours. • Try not to use long distance cabling for power connectivity, as distance causes the power to breakdown. • Make sure all connectors, nuts and bolts are properly tightened. • Appropriate load distribution as per phase. • Do regular check-ups on fuel level. • Do not start generator on load. • Avoid adding acid of any strength to the Battery, for topping up prefer using up distilled water.